Our selfish and our selfless selves. Are they so very different? Insights from the novelist Jeffrey Eugenides, an ant entomologist and a neuroscientist. The Forum is broadcast from partner station WNYC in New York this week, a city renowned for its assertive inhabitants. But are they really selfish? We explore what it means for us to be selfish and selfless. Are these motivations so very different? And how does the world of insects compare? Guest host astrophysicist Janna Levin is joined by Pulitzer-prize winning novelist Jeffrey Eugenides, who explores selfishness in his latest work, The Marriage Plot, as his characters fall in and out of love. We also hear from Heather Berlin, a neuroscientist who focuses on how our brains relate to our behaviour and entomologist Mark Moffett, who has immersed himself in the world of ants in order to understand the way that their societies operate. 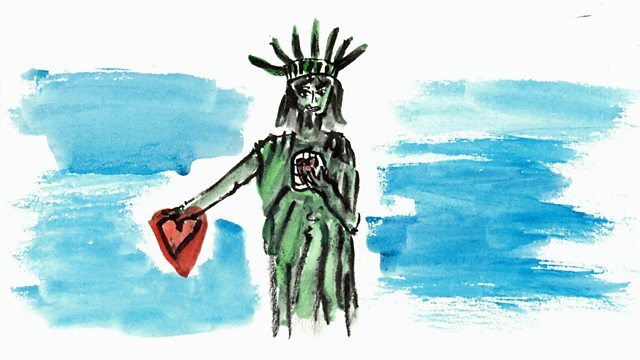 Illustration by Emily Kasriel: New York generously sharing it's heart? Or does it only seek to protect itself? New Yorkers: Selfish or Selfless?